“They’re pretty easy and they go with everything” are great characteristics for noodles, but not so much for the people you date. 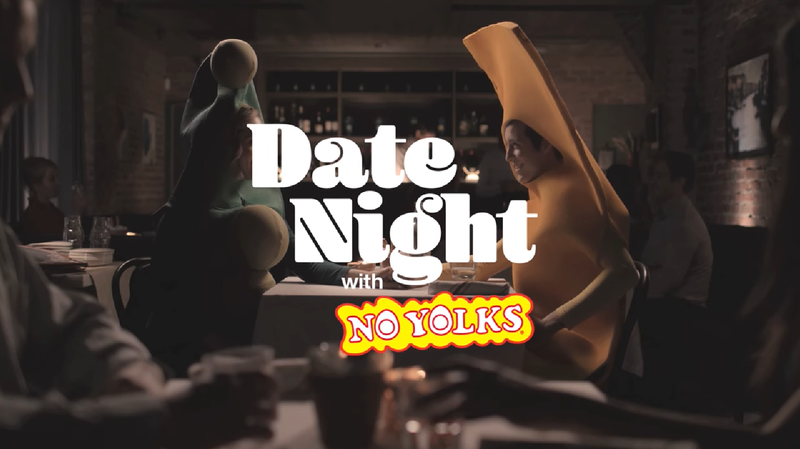 That’s the message behind a new social campaign introduced last week by leading egg noodle brand, No Yolks. Targeted to 18-30-year-olds, the Bring Home No Yolks campaign launched by the low-fat, cholesterol and sodium-free noodle maker features a life-size, health-conscious stud of a noodle caught in a love triangle with several other life-size foods. The results for the player of a noodle may be less than desirable, but for wannabe-cooks, the message is loud and clear: No Yolks noodles are easy, versatile and fun. And, like the stud, they’re always firm yet fluffy. With the product traditionally consumed by a 40+ crowd – largely as a result of its health benefits – and experiencing double-digit growth year over year, the manufacturer is now expanding its reach to millennials to fill what it views as a gap in quick, easy and delicious meal options for Generation Y’ers. The advertising agency behind the promotion, Toronto-based Elemental, is betting that the campaign’s uniqueness is a recipe for success among a younger audience, thanks to the double entendre dialogue by the costume-clad actors – a noodle, pea pod, cheese wedge and slice of bacon. Launched as an online promotion for starters, the campaign – which runs until December 8 – uses a mix of video and social posts on YouTube, Facebook, Twitter and Instagram with the hashtag #BringHomeNoYolks. As part of the campaign, two simple and delicious No Yolks recipes have been launched – One Pot Cheesy Taco Noodles (promoted as “one pot = few dishes = more kisses”) and Asian Fried Noodles (asking consumers to “take a wok on the wild side”) – with more to come.